This tutorial will teach you the basics of building an asynchronous ASP.NET Web Forms application using Visual Studio Express 2012 for Web, which is a free version of Microsoft Visual Studio. You can also use Visual Studio 2012. The following sections are included in this tutorial. https://github.com/RickAndMSFT/Async-ASP.NET/ on the GitHub site. ASP.NET 4.5 Web Pages in combination .NET 4.5 enables you to register asynchronous methods that return an object of type Task. The .NET Framework 4 introduced an asynchronous programming concept referred to as a Task and ASP.NET 4.5 supports Task. Tasks are represented by the Task type and related types in the System.Threading.Tasks namespace. The .NET Framework 4.5 builds on this asynchronous support with the await and async keywords that make working with Task objects much less complex than previous asynchronous approaches. The await keyword is syntactical shorthand for indicating that a piece of code should asynchronously wait on some other piece of code. The async keyword represents a hint that you can use to mark methods as task-based asynchronous methods. The combination of await, async, and the Task object makes it much easier for you to write asynchronous code in .NET 4.5. The new model for asynchronous methods is called the Task-based Asynchronous Pattern (TAP). This tutorial assumes you have some familiarity with asynchronous programing using await and async keywords and the Task namespace. For more information on the using await and async keywords and the Task namespace, see the following references. This might not be a problem, because the thread pool can be made large enough to accommodate many busy threads. However, the number of threads in the thread pool is limited (the default maximum for .NET 4.5 is 5,000). In large applications with high concurrency of long-running requests, all available threads might be busy. This condition is known as thread starvation. When this condition is reached, the web server queues requests. 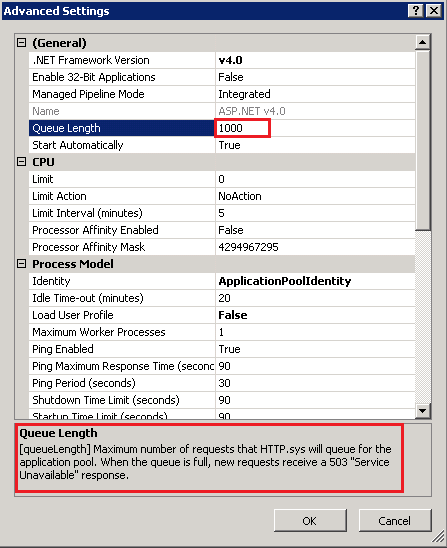 If the request queue becomes full, the web server rejects requests with an HTTP 503 status (Server Too Busy). The CLR thread pool has limitations on new thread injections. If concurrency is bursty (that is, your web site can suddenly get a large number of requests) and all available request threads are busy because of backend calls with high latency, the limited thread injection rate can make your application respond very poorly. Additionally, each new thread added to the thread pool has overhead (such as 1 MB of stack memory). A web application using synchronous methods to service high latency calls where the thread pool grows to the .NET 4.5 default maximum of 5, 000 threads would consume approximately 5 GB more memory than an application able the service the same requests using asynchronous methods and only 50 threads. When you're doing asynchronous work, you're not always using a thread. For example, when you make an asynchronous web service request, ASP.NET will not be using any threads between the async method call and the await. Using the thread pool to service requests with high latency can lead to a large memory footprint and poor utilization of the server hardware. You're calling services that can be consumed through asynchronous methods, and you're using .NET 4.5 or higher. When the benefit of switching threads outweighs the cost of the context switch. In general, you should make a method asynchronous if the synchronous method blocks the ASP.NET request thread while doing no work. By making the call asynchronous, the ASP.NET request thread is not blocked doing no work while it waits for the web service request to complete. The downloadable sample shows how to use asynchronous methods effectively. 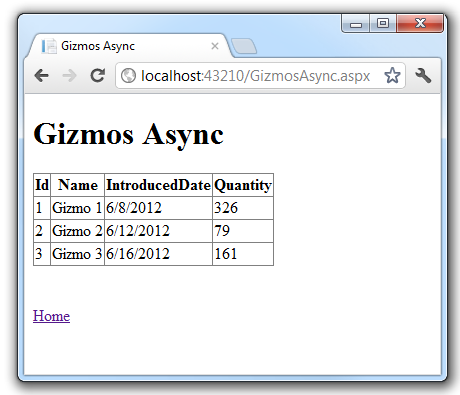 The sample provided was designed to provide a simple demonstration of asynchronous programming in ASP.NET 4.5. 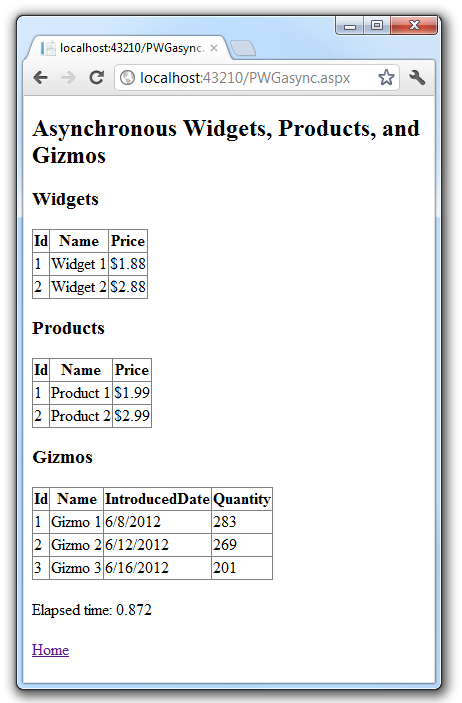 The sample is not intended to be a reference architecture for asynchronous programming in ASP.NET. 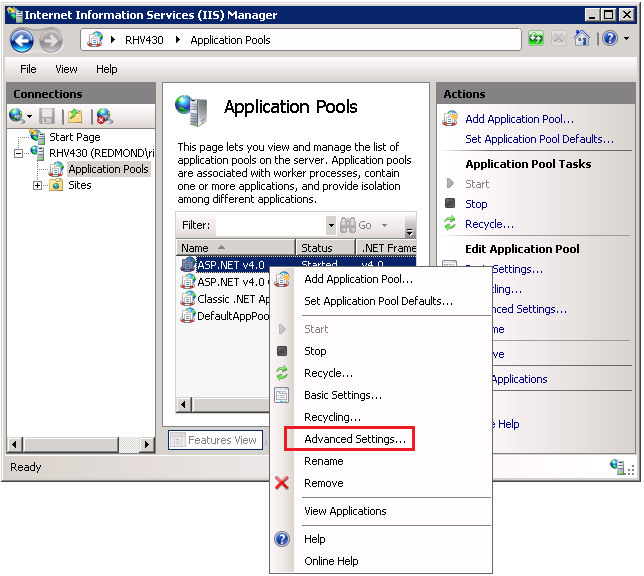 The sample program calls ASP.NET Web API methods which in turn call Task.Delay to simulate long-running web service calls. Most production applications will not show such obvious benefits to using asynchronous Methods. WebAppAsync: The ASP.NET Web Forms project that consumes the Web API WebAPIpwg service. Most of the code for this tutorial is from the this project. 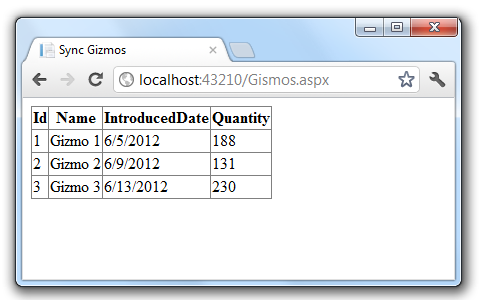 WebAPIpgw: The ASP.NET MVC 4 Web API project that implements the Products, Gizmos and Widgets controllers. It provides the data for the WebAppAsync project and the Mvc4Async project. The sample uses the new async and await keywords (available in .NET 4.5 and Visual Studio 2012) to let the compiler be responsible for maintaining the complicated transformations necessary for asynchronous programming. The compiler lets you write code using the C#'s synchronous control flow constructs and the compiler automatically applies the transformations necessary to use callbacks in order to avoid blocking threads. ASP.NET asynchronous pages must include the Page directive with the Async attribute set to "true". The following code shows the Page directive with the Async attribute set to "true" for the GizmosAsync.aspx page. <%@ Page Async="true"  Language="C#" AutoEventWireup="true"
The following code shows the Gizmos synchronous Page_Load method and the GizmosAsync asynchronous page. If your browser supports the HTML 5 <mark> element, you'll see the changes in GizmosAsync in yellow highlight. The Page directive must have the Async attribute set to "true". The new GetGizmosSvcAsync method is marked with the async keyword, which tells the compiler to generate callbacks for parts of the body and to automatically create a Task that is returned. "Async" was appended to the asynchronous method name. Appending "Async" is not required but is the convention when writing asynchronous methods. The return type of the new GetGizmosSvcAsync method is Task. The return type of Task represents ongoing work and provides callers of the method with a handle through which to wait for the asynchronous operation's completion. Inside of the GetGizmosSvcAsync method body another asynchronous method, GetGizmosAsync is called. GetGizmosAsync immediately returns a Task<List<Gizmo>> that will eventually complete when the data is available. Because you don't want to do anything else until you have the gizmo data, the code awaits the task (using the await keyword). You can use the await keyword only in methods annotated with the async keyword. The await keyword does not block the thread until the task is complete. It signs up the rest of the method as a callback on the task, and immediately returns. When the awaited task eventually completes, it will invoke that callback and thus resume the execution of the method right where it left off. For more information on using the await and async keywords and the Task namespace, see the async references. The downside to async void events is that developers no longer has full control over when events execute. For example, if both an .aspx and a .Master define Page_Load events and one or both of them are asynchronous, the order of execution can't be guaranteed. The same indeterminiate order for non event handlers (such as async void Button_Click ) applies. For most developers this should be acceptable, but those who require full control over the order of execution should only use APIs like RegisterAsyncTask that consume methods which return a Task object. The following image shows the view returned from the asynchronous PWGasync.aspx page. Asynchronous Methods returning Taskare cancelable, that is they take a CancellationToken parameter when one is provided with the AsyncTimeout attribute of the Page directive. The following code shows the GizmosCancelAsync.aspx page with a timeout of on second. In the sample application provided, selecting the GizmosCancelAsync link calls the GizmosCancelAsync.aspx page and demonstrates the cancellation (by timing out) of the asynchronous call. Because the delay time is within a random range, you might need to refresh the page a couple times to get the time out error message. Windows 7, Windows Vista, Window 8, and all Windows client operating systems have a maximum of 10 concurrent requests. You'll need a Windows Server operating system to see the benefits of asynchronous methods under high load. In the Advanced Settings dialog box, change Queue Length from 1,000 to 5,000.